When you use a traditional "middle-of-the-table" projector, cables get in the way and the noisy fan can be a distraction. 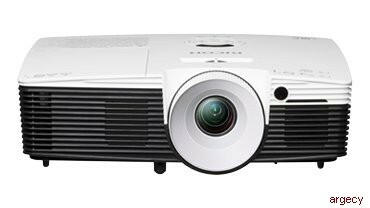 Ricoh's PJ X3351N standard-width desk edge projector can be placed at the front edge of a table, well away from the participants - so you can share information without disruption. And, with the projector closer to the screen, you can reduce shadows and glare. To protect corporate information, you want to keep guests on the guest network and employees on your secure network. You can do this easily because the PJ X3351N comes with both wired and wireless networking, so everyone can access the information they need. You can even project information from Android and PC smart devices with Miracast connectivity. Your old whiteboard has served you well, but it limits your ability to capture notes and circulate them. When you use the optional interactive toolkit for the PJ X3351N, you can turn a static whiteboard into a digital whiteboard. Use the digital pen and drawing software to express your ideas your way and share them easily with the group. Sometimes you want to market a project creatively, get people's attention in an unexpected way, or spice up a training session. Use the 360-degree installation angle to project on ceilings or floors. Keystone correction automatically fixes any image distortion. 30" - 400"/26.7" - 568.2"